Bitcoin ATM in Deli & Grocery on Lexington Ave. & 125th St.
Like many bodegas in East Harlem, Apollo Deli & Fruit has an ATM machine perched in the corner of their store. People use the machine often. Getting cash to buy sandwiches and drinks. 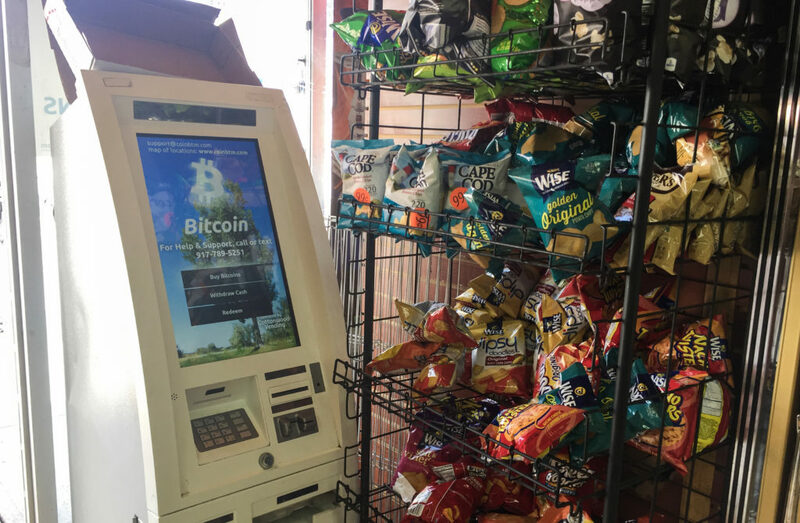 But this Deli, on the corner of Frederick Douglass Blvd and 126th St, has a second ATM sitting near its entrance – and this one dispenses bitcoins. Bitcoins are a digital cryptocurrency based off of blockchain technology. The currency has gotten a lot of negative press recently becuase it has become the payment method of choice demanded by ransomware criminals when they hijack computers. Bitcoin users can buy coins using credit cards or bank transfers on online exchanges all around the world. Adopters of the technology can also use ATMs to buy the currency with cash immediately. According to coinmap, a website that shows businesses and ATMs that accept Bitcoin, there are over 100 physical business accepting Bitcoin across Manhattan, Brooklyn, and Queens. Harlem, although listed as having two Bitcoin ATMs, is missing any brick-and-morter shops that accept the payment. Workers in the bodegas where these machines reside are unaware of how the machines work and what Bitcoin does. “I don’t even know how to use it,” exclaimed Sam Alsadi, a cook at Apollo Deli & Fruit, when asked about the Bitcoin ATM machine. Jawad Alrubay, another worker at the bodega was also unsure about the machine. 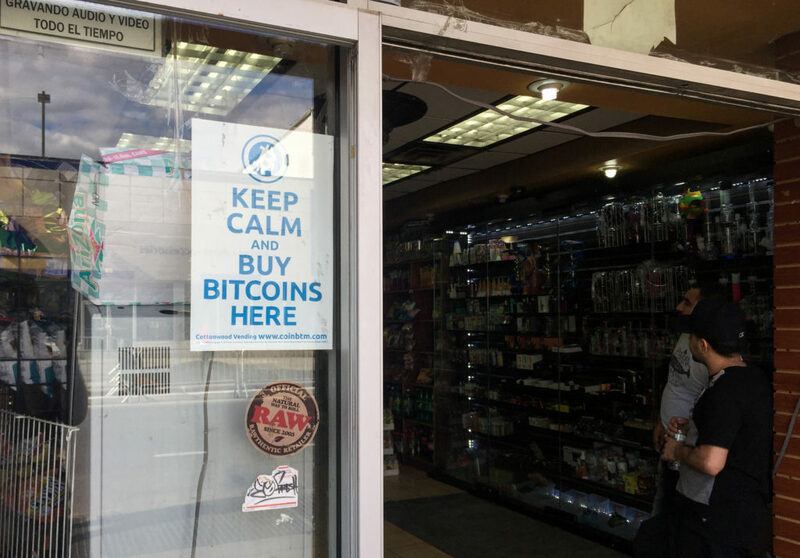 Many people come into the bodega to use the ATM, either using cash to buy more Bitcoin, or withdrawing cash from Bitcoin, according to Alsadi. The Bitcoin ATM is relatively new in Apollo Deli & Fruit. It was installed less than a year ago when Cottonwood Vending LLC contacted Alrubay’s oldest cousin to install it in the store. Cottonwood Vending LLC did not respond to questions via email regarding their ATMs in Harlem. According to its website, the company provides the largest Bitcoin ATM network in New York, with 47 registered ATMs. Alsadi believes that Cottonwood chose Apollo to house the machine because the company requires a certain number of miles between each Bitcoin ATM. A sign letting customers know that bitcoins are sold at Deli & Grocery on Lexington Ave. & 125th St.
Nick Spanos, founder of The Bitcoin Center NYC, an educational center that aims to inform the community on bitcoin, has been manufacturing DAVE (Digital Asset Vending Equipment) Bitcoin ATMs and shipping them around the world to operators since opening the center in 2013. Spanos, who grew up in Astoria, spent over $100,000 on lawyers and legal fees to make sure that his ATMs were compliant to New York State codes regarding ATMs. DAVE Bitcoin ATMs require the customer to input a phone number, so they can be checked against an OFAC (Office of Foreign Assets Control) list. There is no comprehensive background check on the machines, but if an individual is on a no-fly list, the transaction will be declined, according to Spanos. Although there are many places online to buy different cryptocurrency, Spanos says that ATMs still play an important role in the crytocurrency market. “[ATMs are] the last mile for some people to get their hands on Bitcoin,” said Spanos. People use Bitcoin ATMs for a multitude of reasons. Whether that it be for investing, the ease of access for storing savings, or a dwindling trust in banks or fiat (government-backed currency). David, a music teacher in New York City, who insisted his last name not be used because he no longer wishes to have his business associated with Bitcoin because of its negative reputation, had previously accepted the cryptocurrency as a payment for music lessons. “I heard about [Bitcoin] when the Silk Road was busted. As an investor, when an asset crashes it’s usually a good time to buy,” said David. The Silk Road, an online marketplace hosted on the dark web, accepted Bitcoin as payment for illegal drugs and various other nefarious products and services, until it was eventually shut down in 2013 by the FBI, according to a United States District Court, Southern District of New York document. Although he was accepting payment and received tips sparsely with the online currency, David stopped letting customers know that he accepted it. However, David admits that he has made more money trading and investing in Bitcoin than in his music profession. David has never used a Bitcoin ATM but believes that people might be using Bitcoin ATMs to gain extra revenue. “I think the ATM’s are mostly being used by people who are paid in cash and want to get Bitcoin because it gains in value over time, unlike cash,” he said. 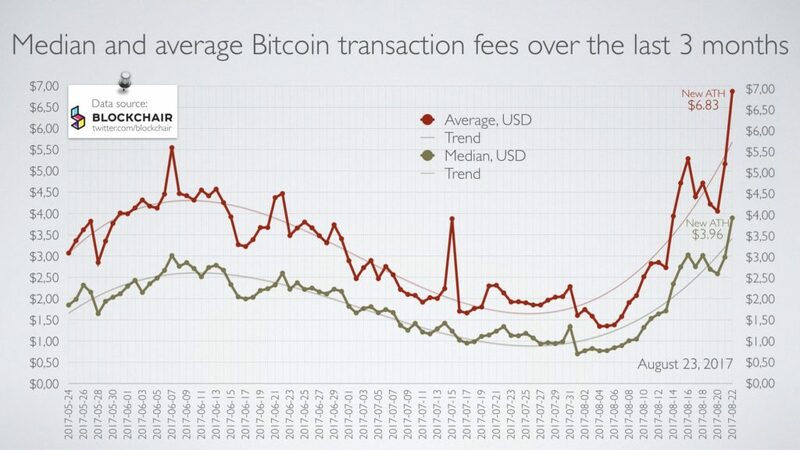 Because of rising fees, Bitcoin has been difficult to use for day-to-day purchases, making it harder and less incentivizing for small businesses to accept it. Blockchair, a blockchain search and analytics engine, found that the average fee for transactions hit an all time high on August 23, growing to $6.83. Although the adoption of Bitcoin by small businesses is progressing slowly, Spanos is still confident that in the near future the cryptocurrency will be accepted everywhere.